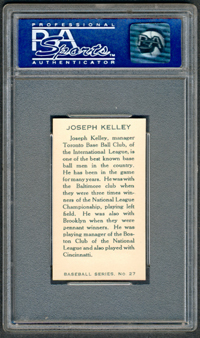 Joseph Kelley played for the great Baltimore teams of the 1890s and later went to star with Brooklyn and Cincinnati. He batted over .300 for 11 straight years. In 1894, he hit .393 and batted a perfect 9 for 9 in a doubleheader. 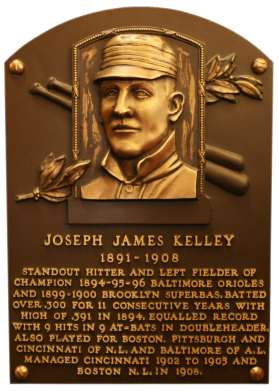 Kelley had a lifetime .317 average, with 194 triples, 1,424 runs scored, and 1,193 RBI. Comments: I first picked up a raw 1976 Shakey's tribute card in April, 2003. Two months later, in June, I won an eBay auction for a SGC 88 1906 Fan Craze card. In July, 2005 I swapped out the Fan Craze by picking up a PSA 4 C46 card at the National. In November, 2007 I made another change - going after a Colgan's Chip card. Upon receipt and some additional research, I learned the item didn't picture Joseph Kelley. 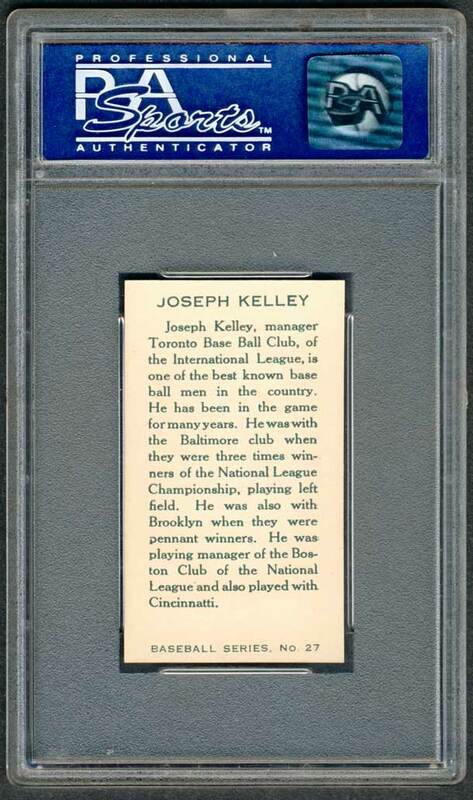 It was actually a different player mislabeled as Joseph Kelley. That wouldn't work for this collection so I went back to the C46 PSA 4 which I still owned. In April, 2010 I won an eBay auction for a raw C46 Imperial Tobacco card from a seller in Canada - Cartes Sportives De La Capitale (Sylvain Martineau). It was a big risk as I typically don't buy vintage cards that have not been authenticated by a third-party. But, it was a Canadian card purchased from a dealer in Canada, and the scans looked good - card looked like an upgrade. The gamble paid off as PSA graded the item EX a couple months later - SCORE! UPDATE: On 11/4/2013 I went to the post office to pick up a package from REA - my Newsboy Rusie had arrived. In my PO Box was the latest copy of Memory Lane's Buy It Now issue and I thumbed through the magazine. 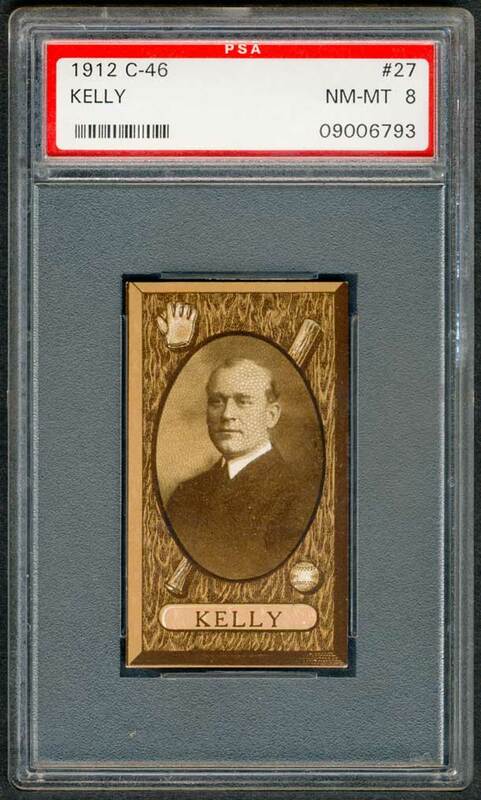 There were some great cards but one stood out - a PSA 8 1912 C46 Kelly. The highest graded example I had ever seen available to the public was a PSA 6 example in January, 2010. I called the auction house and asked the gentlemen to set the card aside for 30 minutes, enough time for me to review the images. I arrived back at the office and immediately went online to take a look at the high resolution scans. According to the PSA Population Report it was the highest graded copy with no others at it's tier - no 7s either, with the single PSA 6. I quickly called back and placed the order. The card looked so clean -can't wait to get it! Description: The minor league set, issued in 1912 by the Imperial Tobacco Company, is the only tobacco baseball set issued in Canada.